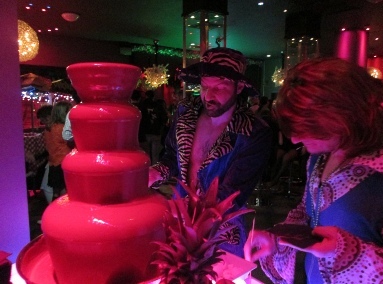 The aroma of the chocolate fountain. Delicious to taste. 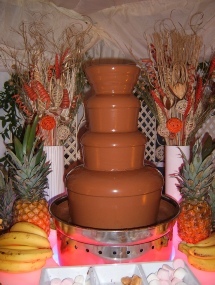 Classy chocolate fountain surround and quirky presentation, attended service. An exhibition stand Idea to woo clients to your trade stand? This exhibition stand idea is always an irresistible attraction for not only the potential customers but also some of your own! 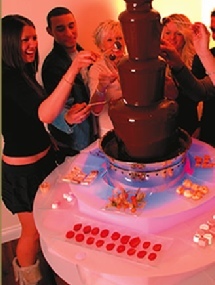 When a chocolate fountain flows and glistens; it is a great attraction that will aid with client engagement. We will supply all the consumables required throughout the exhibition. The staff will be happy to wear your company colours or themed attire on your stand. 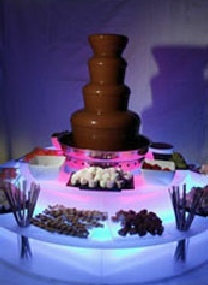 Where Can I hire a trade stand attraction of a Chocolate fountain, attended ? From us we hope! Millennium Gloucester Hotel, Earls Court, Alexandra Palace, ExCeL, Business Design Centre, Bournemouth International Centre, The O2 Arena, Donington Exhibition Centre, Donington Park, Ricoh Arena, Epsom Downs Racecourse, Hilton Brighton Metropole Hotel, G-Mex Centre, Manchester Central Convention Complex, Novotel London West, National Exhibition Centre, Queen Elizabeth II Conference Centre, Stoneleigh Park, Old Billingsgate, Olympia, Sandown Park Exhibition and Conference Centre, Telford International Centre, The Royal Armouries Museum,The Brighton Centre, Park Plaza Westminster Bridge, Cardiff International Arena, Central London.